Girly Girl Giveaways: Bulu Box Deal Alert! Monthly Subscription boxes are all the rage, right? 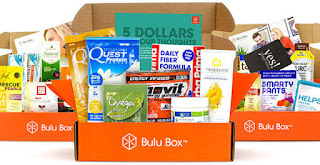 Have you heard of Bulu Box? Bulu Box is a monthly subscription box filled with items for a healthier you. Each month you will receive a box of healthy discoveries shipped to your door for your just $10 a month. Each box will include 4 to 5 premium samples to try and hopefully find products that fit your healthy lifestyle. Bulu Box has 2 box options, Bulu Box Original and Bulu Box Weight Loss. They have several monthly plans to choose from and you can cancel at anytime. For sharing your opinions on each month's samples through a quick survey, they will give you 50 Rewards Points (that's $5!) to use in their shop to get more of your favorites. Get a 3 Month Subscription for just $15 (regularly $30)! Just use the code WOWZA at checkout.